Emily and I went to Charlottes school to help with their party. It was fun to see all of her friends and see all of the fun they had. They decorated cookies and ate cupcakes, played bingo, pin the nose on the pumpkin, went fishing, and a ton of other games. Cami Green read a cute story to the kids and Em helped out by wearing the witches hat. Last week we were able to head out to California for a week with my parents. We had such an awesome time. We stayed in Newport Beach at the Marriott Newport Coast Villas and loved it. We got there a day and a half before my parents so we just hung out at the hotel and swam. These are a few pics of the resort where we stayed. We picked up my parents in San Diego so we spent the day there. Most of you know that we can't go on a family vacation without going to a National Park and learning something new about this wonderful country. This time we went to the Cabrillo National Monument. It is a light house and at the top you can see all of downtown San Diego. The ocean is so beautiful and so is the city. "The Phone Call" - Oh, it's a good read... wait for it. I am a guy who loves his family very much. I would pretty much do anything for the 3 chicks and a dude that live in our home in Herriman. Yeah, so I go to work everyday to provide for them and buy my kids popsicles... that's just what it's about. Come take a ride with me on my way home this evening. - KBULL 93 jamming on the radio - I respond to the Rascal Flatts Fly Away Contest by sending in a text message. - Another text message comes in confirming my entry to the fly away and well wishes for success in the contest. - A text message from one of my managers asking me about one of the other sales reps that works for him. - KBULL plays one of my favorite songs and I sing on the way home. - After our recent storm the weather leaves the sky so clear thatI can see China to the West and think to myself, wow, this would be great light for some photos tonight. Jill: "I need to take Charlotte to the hospital"
Jill: "She fell and hit her head outside, by the trampoline"
me: "Why do you need to take her to the hospital?" Jill (crying now): "She has two holes in her head and she's really smacked her eye." me: "Honey, I'm 90 seconds away. Everything will be okay, I'll be right there"
I arrive to find my sweet little Charlotte Rose crying and in mom's arms. Emily has Charlotte's blood on her shirt, and Charlotte has blood all over her hands and across her forehead. 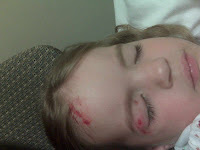 Her eye is a little bit swollen and with a significant amount of gashing on it. Needless to say, Dad wished that he had a popsicle that he could give his little girl. 5 minutes later... we're in the van driving to the emergency room. Mom is sitting in between the two back seats of the car, trying to comfort the little girl, who is still crying. 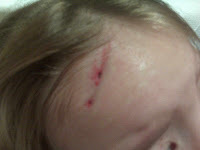 At the same time, Charlotte is crying and at the same time telling the story of how she hit her head. "And I just tripped and I fell down and now my head hurts. I don't want to get a shot"
I reached back and rubbed her little foot because that's the only part of her that I can touch. I said to her, "Charlotte, do you think we could say a prayer and ask Heavenly Father to bless us on our way and to bless the doctors to make you feel better?" It took a moment to convince her, but she consented to having mommy say the prayer. My dear wife said the prayer (with some tears from both mom and dad). Charlotte calmed down until we were pulling into the hospital parking lot, when she asked: "Mom, are we almost there, my head really hurts." Fast forward past the check-in part because it was pretty boring. Charlotte: "I don't want to get a shot." Dad: "It's okay Char, everything will be fine." This last part is difficult to remember exactly, but she said something about dying and not seeing Emily or William anymore. I looked over to Jill and saw the redness around her eyes. She kept it together. Needless to say, after some derma glue and a good soap washing, Charlotte will be okay. She's going to have a black eye and a headache, but we managed to get her home and in bed with her bankely. Oh, by the way, when we left the hospital, Charlotte got herself two grape popsicles. My work today is done. Here is some art for your viewing pleasure (I'll apologize for the quality - I didn't come prepared with my go-go-gadget Nikon - so the Blackberry phone will have to do). She fell asleep after sitting on my lap for about 15 minutes. But, when the orderly came in to wash her forehead, she woke up and was not too happy about the whole thing. I'll say this for her: She is one brave little girl. 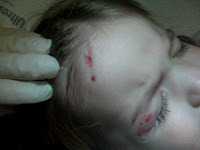 She didn't fight and only cried when the doctor pressed her little head back together. I am very proud of her. P.S. - I'm going to wake her up now because the doctor told us to. We need to make sure she's "acting normal-whatever normal is for her" and check to "make sure she hasn't vomitted all over herself." What if vomitting all over herself is normal? And, frankly, I don't know how to judge if Char is normal at this hour. She's liable to scream at me for waking her up...that's probably what I would do. My sister and her friends get together and do crafts each Tuesday. This is what they made with a little help from me and my magic vinyl machine. I want to start a crafters group and meet twice a month and do a fun craft. This will be a good time to do some inexpensive crafts and get together with friends. I thought for Thanksgiving we could make these with fall paper and the lettering "Give Thanks" or "Harvest". What are your thoughts? If you would like to join me and the mouse in my pocket leave a comment or email me at supercuteknotwell@gmail.com . I made this Halloween countdown after seeing my sister-in-laws. My sister and I created these all on our own and I am so proud of it. This took me way too long to make, but worth it! Jill has been wanting to decorate William's room with something "boy" for a long time, probably at least 18 months. Well, we have a friend that lives down the street that just so happens to paint on walls! Heather Dalton came over and painted this in about two nights. It covers about 2/3 of one wall in our house. We are so happy with the way it turned out and highly recommend her to anyone looking to have their walls decorated. She can paint "just about anything" as long as she can see it! The best part of this plane is the pilot... it looks just like Mr. Will - long hair and all. Note to Self... is there a way to lock this thing? If you had visited our blog in the last few days, I apologize for the dreary blandness that you saw. My sweet wife tried to make a change... "I wanted to make it cute" she lovingly said to me. Disaster averted... hope you like the new seasonal look. We'll try to get it changed before spring.